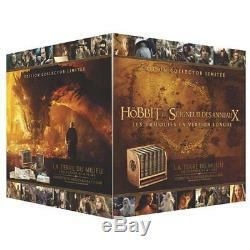 Blu-ray - blu-ray the hobbit and the lord of the rings, the trilogies - edition. Product Descriptionblu-ray the hobbit and the lord of the rings, the trilogies - collector's edition middle earth - to warner bros limited collector's box set "middle earth" each film (+ bonus) is proposed in a faux leather book with gilding and embossing contains: - "the hobbit: an unexpected journey" (1 blu-ray of the movie in long version + 3 blu-ray bonus) - "the hobbit: the desolation of smaug" (1 blu-ray of the film in long version + 3 blu -ray bonus) - "hobbit: the battle of the five armies" (1 blu-ray of the movie in long version + 3 blu-ray bonus) - "the lord of the rings - the community of the ring" (2 blu-ray of the movie in long version + 4 dvd of bonus) - "the lord of the rings - the two towers" (2 blu-ray of the movie in long version + 4 dvd of bonus) - "the lord of the rings - the return of the King "(2 blu-ray of the movie in long version + 4 bonus dvd) - the" red book of the west market "with original drawings and 5 illustrations on loose leaves (100 pages) - 2 watercolor reproductions signed alan lee and john howe- 1 storage shelf hobbit style, wood, for 6 films and booksynopsiscontents: - the hobbit, the trilogy: recruited by gandalf the gray, bilbon sacquet joined a band of 13 dwarfs whose leader is none other than the legendary Thorin-oak warrior who seeks to regain the lost kingdom of the erebor dwarves, conquered by the fearsome dragon smaug. Their journey takes them to the heart of the wild country, where they will face goblins, orcas, murderous ouargues, giant spiders, shapeshifters and wizards ... Although they are destined to set course on the east and the desert lands of the lonely mount, they must first escape the tunnels of goblins, where bilbon meets the creature that will forever change the course of his life: gollum. It is there, on the shores of an underground lake, that the modest bilbon sacquet not only surprises himself with unexpected courage and intelligence, but manages to get his hands on the "precious "ring that conceals hidden powers ... This simple ring of gold is linked to the fate of the middle earth, without bilbon can still doubt ... The lord of the rings, the trilogy: the young hobbit frodo saquet inherits a ring. This is the unique ring, an instrument of absolute power that would allow sauron, lord of darkness, to reign on the middle earth and to enslave his peoples ... Thus begins the epic trilogy of Lord of the Rings , available in full in this box! Actors: ian mckellen, martin freeman, john callen, peter hambleton, jed brophyrealizers: peter jacksonaudio: italian (dolby digital 5.1), english (dts-hd 6.1), english (dts-hd 7.1), french (dts-hd 6.1) , french (dolby digital 5.1), french (dts-hd 7.1), french (dts-hd 5.1), castilian (dolby digital 5.1), french, italian, english, castillansubtitles: french, dutch, english,ish, italianregion : all regions number of discs: 30studio: warner bros. Release date of the DVD: November 16, 2016, duration: 1245 minutes. Product Description blu-ray hobbit and lord of the rings, trilogies - collector's edition middle earth - to warner bros limited collector's box set "middle earth" each film (+ bonus) is offered in a faux leather book with gilding and embossing contains : - "the hobbit: an unexpected journey" (1 blu-ray of the film in long version + 3 blu-ray of bonus) - "the hobbit: the desolation of smaug" (1 blu-ray of the film in long version + 3 blu-ray bonus) - "the hobbit: the battle of the five armies" (1 blu-ray of the movie in long version + 3 bonus blu-ray) - "the lord of the rings - the community of the ring" ( 2 blu-ray movie in long version + 4 bonus dvd) - "Lord of the Rings - the two rounds" (2 blu-ray of the movie in long version + 4 bonus dvd) - "Lord of the Rings - the return of the king "(2 blu-ray of the movie in long version + 4 dvd of bonus) - the" red book of the market of the west "with original drawings and 5 illustrations on loose leaves (100 pages) - 2 reproductions of watercolors signed alan lee and john howe- 1 hobbit style wooden storage shelf, for the 6 films and the book synopsis contains: - the hobbit, the trilogy: recruited by gandalf the gray, bilbon sacquet joined a band of 13 dwarfs whose leader is none other than the legendary warrior thorin ecu-oak who seeks to take back the lost kingdom of the dwarves of erebor, conquered by the fearsome dragon smaug. Release date of the DVD: November 16, 2016 Duration: 1245 minutes. For more information on delivery, click on delivery and payments above the description. For more information on delivery, click on more info. Sorry, our products are not available for withdrawal in store. On request, we offer the possibility to pay by bank transfer. No checks will be accepted. The law n 81-766 of August 10, 1981 relative to the price of the book, known as law lang (of the name of jack lang, minister of the culture), is a law establishing a unique price of the book in France. Ask the seller a question. Manga - academy alice (the) vol. Manga - princess sakura vol. Manga - nijika, dream actress, tome 3. Manga - nijika, dream actress, tome 5. To contact the customer service, simply click on the button and we will be happy to assist you. Delivery is free for this item (metropolitan France only). Upon request, we accept payment by transfer. The object must be returned within 14 days after receipt. The buyer pays the return costs. Returns are possible for 14 days after receipt of your order. The return costs are the responsibility of the buyer. For an object to be returned, it must be in the same condition as when it was received, the packaging must be present and in good condition (not torn), all parts, accessories and notices must be included in the return. Please note that according to the regulations in force, the right of withdrawal can not be exercised for customizable books, audio recordings, video or computer software unsealed by the customer .. books will not be resumed if they show traces folds, horny pages, writing .. the item "blu-ray blu-ray the hobbit and the lord of the rings, the trilogies edition" is on sale since Thursday, June 14, 2018. It is in the category "dvd, cinema \ dvd, blu-ray ". The seller is "around_the_clock" and is located in /leans. This item can be shipped to the following country: europe.